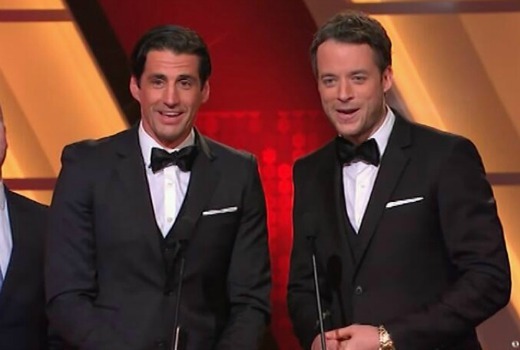 The Block‘s Scott Cam has won the Gold Logie for 2014. “This is really unbelievable,” he said. 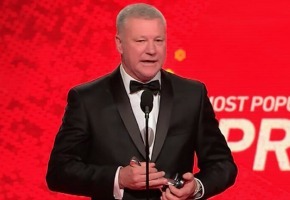 The carpenter turned television presenter thanked former producers who assisted him early in his career, cameramen, network, his co-host, Block judges and family. “I’m not here without a great show like The Block. “I’m so lucky that they asked me to look after their show. “I need to thank the whole Block family. “Everybody works as a family and we all work together really well. He also thanked co-host Shelley Craft. “I really love being part of the Channel Nine family,” he said. “They’ve been extremely loyal to me. 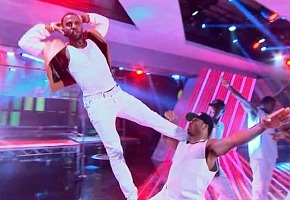 The 56th Logie Awards opened with a Jason Derulo medley but with a few sound problems during “Trumpets.” At least we know he is singing live. First presenters were Hamish and Andy, arriving on a forklift driven by Scott Cam ready to give out “one award an hour,” and checking a script for the night. The boys were getting the laughs for gags about Karl Stefanovic and David Koch doing a ‘Britney / Madonna’ kiss and Jason ‘My Kitchen’ Derulos. Sans host it was a good opening by the boys. “Series 4 was such a confronting and moving series, thank you Matthew LeNevez. 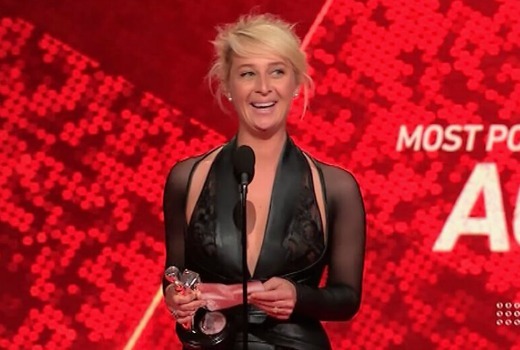 We had extraordinary, brave writing,” said Keddie. Mandy McElhinney and Darren McMullen pressnted Most Popular Actor, with some awkward gags about McMullen turning actor for House Husbands. Promoting Jonah from Tonga in London he sent Kwami to accept, who simply said, “Thank you.” Best acceptance speech of the night? “To be in this position you have to have a good show,” said Cam. “We put together a great show that families and kids love to watch. Patrick Brammall and Madeleine West joked about their flops, Big Reef and Canal Road. Ouch. 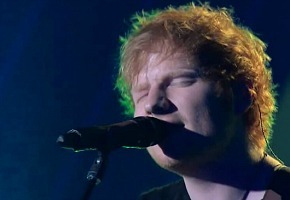 Ed Sheeran put in a good performance, bringing a bit of legit to the night. Hughesy is getting the laughs at the expense of The Block, Bondi Rescue, Big Brother, My Kitchen Rules, The Biggest Loser. He could almost host the show (but would three hours of Hughesy be a big ask?). Hughesy joked about driving his complaining kids to McDonald’s drive-thru. “You want activated almonds do you?” he asked. Manu seemed a little overwhelmed. Lisa Wilkinson and Emma Alberici presented a News award, without any need for jokes. Peter Overton made some nice remarks about volunteer fire-fighters and the people affected by the bush fires. Kylie sang her new single, with multi-tracking. The crowd is on its feet. It’s Kylie after all. Amanda Keller and Karl Stefanovic joked about Home and Away snorting No-Doze in the toilets. Yikes. “Hamish and I love holidaying,” said Lee. “Thanks for paying it,” added Blake. 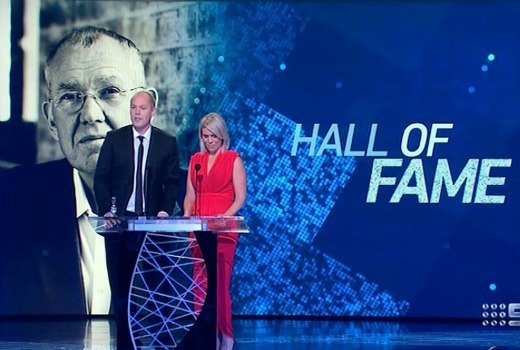 Peter Harvey is posthumously inducted into the Hall of Fame (as tipped in this site’s Logie survey), introduced by Tara Brown. 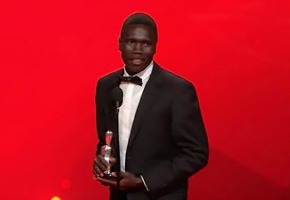 Fittingly he receives a standing ovation, with Claire and Adam Harvey thanking the Logies and remembering their father. “We miss him every day and we still hear his voice introducing Nine News in Sydney every night. It’s comforting. He’s only ever as far away as the television. And we know Dad would just love the idea of all of us here tonight, raising a glass to him. Thank you so much,” they said. “Thank you to everyone who void and everyone who watches the show and let us live our dream,” said Sveen. She also acknowledged that viewers had embraced someone “a natural healthy woman” on their TV screens. As she also acknowledged the traditional owners, this was one of the more classy speeches. “Tim Worner always talks about three pillars of television. I can’t remember two of them but Live Sport’s the third one! This is great for the network.” said Bruce McAvanaey. Mike Munro commentates a lovely This is Your Life montage for TEN’s 50th birthday (it’s coming in a few months). Good on Nine for including this. 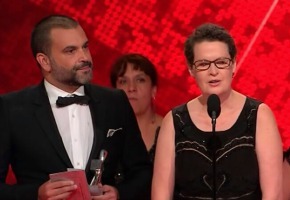 Garth Davis thanked Jane Campion, Gerard Lee, BBC Australia, and crew. “I wanted to say this is global elevation at its best,” said Robyn Malcolm acknowledging an international cast. 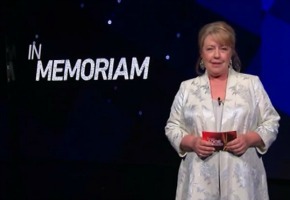 Noni Hazlehurst introduces the In Memoriam tribute as Tina Arena sings. It begins with Wendy Hughes and ends with Charlotte Dawson -as it should. Kate Ritchie and Anthony Hayes introduce the next category, with some curious references to Claudia Karvan and Asher Keddie. “How much Silver do they need to feel validated?” Hayes asked. “I feel so honoured to be amongst this group of women. Amazing. I watch you every day,” said Keddie. She also dedicated the award to Wendy Hughes. Great to see a first win for Hulme. “Yeah it’s got my name on it,” he said. 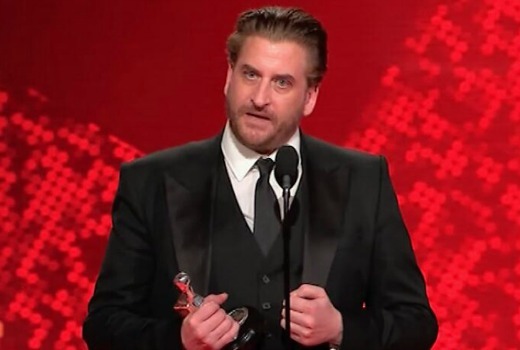 He didn’t thank the network producers, cast, crew, publicist or agent but Working Dog productions, the Offspring cast, his brother, sister and his mother. Lincoln Lewis, presenting with Sam Armytage, charms the room by telling all the ladies they looked lovely. 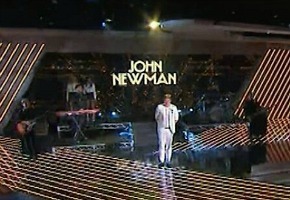 They noted the absence of Comedy, with comedy titles competing against The Voice. “We’ve been pumping it hard for the real Aussies of Australia. We’ve done comedy for the real battlers, for the real people all these years,” he said. “I haven’t prepared anything, I got pissed. This is a great win for the true people of Australia, not the fake stuff that’s out there. Ahh, The Logies have arrived. Craig McLachlan and Julia Morris were were great together, presenting Outstanding Drama. Another potential host right here. 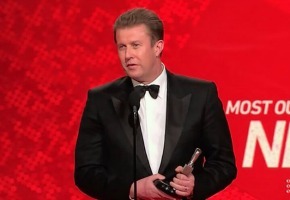 Darren Dale paid tribute to the writers, actors, crew and directors. “Thanks too to Jimmy McGovern, our guiding light for his patience and generosity,” said producer Miranda Dear. MKTO closed the show, but I am still trying to get that visual out of mind. hey lay off Housos! its hilarious as far as un pc toilet humour goes. But i wouldn’t call it outstanding & probably one of the ABC comedies was more deserving as far as scripting & production. Nice to see a lot of my predictions came to pass, but there were some shockers. Chris Lily as most popular actor, what? With Steve Peacock nominated for Gold, you would naturally assume he would get most popular actor. Steve or fellow leading man Mathewe LeNevis were robbed in that category. 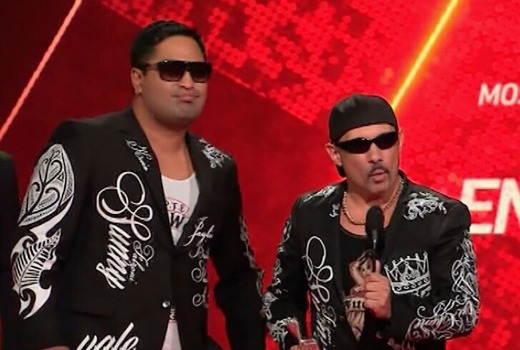 And that Bogan show from SBS winning most outstanding light enetertainment??? I couldn’t bare to watch a minute of that show, much less the awful acceptance speech. Really is a lot to be disired what the judges have considered “outstanding”. Other than that, was glad they shortened the night in parts, it does need it. But yes they should bring back the supporting actor vote. @Gonzo, I think Working Dogs kinda gave him his break back with the Hollowmen. He mentioned he didn’t wanna thank anyone associated with Power Games because they already knew he was grateful. 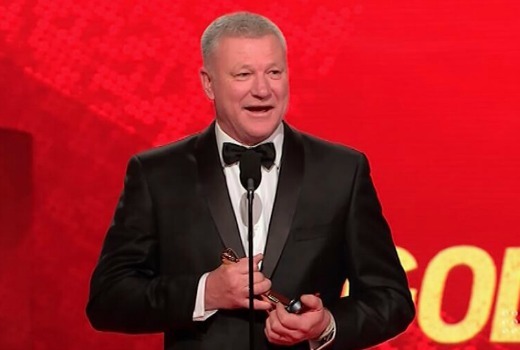 Who thought a humble chippy could win a Logie let alone a Gold Logie! I personally thought Asher was going to win but Scott is a deserving winner. Housos! Big shock. Should give it a look. Has it been renewed? Why would Hulme thank Working Dog Productions? They have nothing to do with either Power Games or Offspring…?? What does it really mean Richard Wilkins? A few people didn’t know what that phrase meant.